Triple Tree Center » What is Reflexology? Whilst the art of Reflexology dates back to Ancient India as Acupressure, it wasn’t until 1913 that Dr William Fitzgerald introduced this therapy to the West as ‘zone therapy’. He noted that reflex areas on the feet and hands were linked to other areas and organs of the body within the same zone. 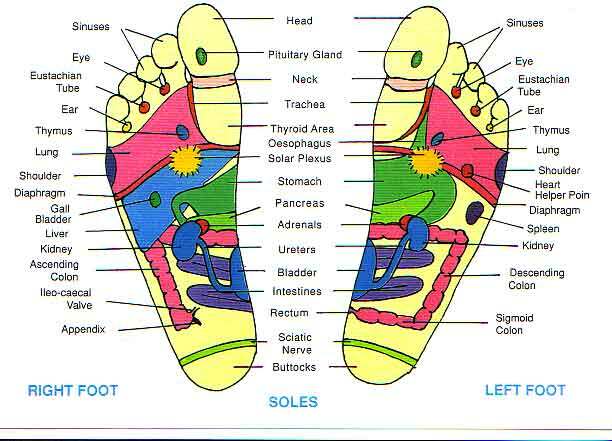 In the 1930’s Eunice Ingham further developed this zone theory into what is now known as reflexology. She observed that congestion or tension in any part of the foot is mirrored in the corresponding part of the body. In reflexology, it is believed that there is a “vital energy or Pranic Energy” that is circulating between organs of the human body, that penetrates into every living cell. Whenever this energy is blocked, the zone of blockage will be affected, and the reflex zones can indicate the blockage of energy in different organs. Therefore, if someone has a problem in a particular organ, a reflexologist will press on the corresponding reflex zone or zones, and the person will experience pain. This pain is claimed to originate from the deposition of crystals in the reflex zone and, with massage, these crystalline structures can be broken down and the pain relieved. Simultaneously, the pressure applied to the reflex zones by the reflexologist is claimed to pass through the nerves to dissipate energy blocks. According to John Campbell, “Reflexology is a powerful natural health science that studies the relationship of the reflex areas in the feet, hands and the ears to the rest of the body so that these areas can be worked on with the fingers and thumbs in a manner that will lead to improved health and the maintenance of good health.” Reflexology is a complementary therapy, which works on the feet to help heal the whole person not just the prevailing symptoms. Reflexology can be used to help restore and maintain the body’s natural equilibrium. This gentle therapy encourages the body to work naturally to restore its own healthy balance.